Green Industry buyers and sellers aren’t making many moves just yet. The mergers and acquisitions (M&A) market has been the equivalent of an ever-long chess game for the Green Industry in 2013. Buyers and sellers are simply strategizing and waiting to make a move before yearend—or in some circumstances make no move at all. For this reason, M&A activity has been relatively low, consultants say, but they caution to “stay tuned” for an upswing in activity the remainder of the year and trickling into the next. 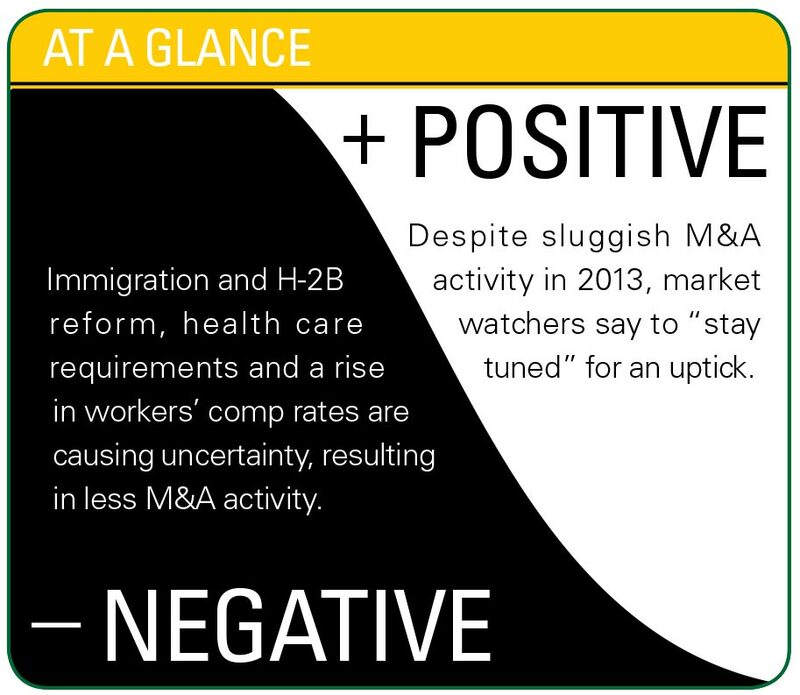 Jeff Harkness, partner with the 3PG Group, credited looming costs of Obamacare, a rise in workers’ comp rates and immigration concerns that could affect the H-2B guest-worker visa program as reasons for companies moving at a sluggish pace on transactions. Harkness says it’s small- to medium-sized companies that have been the most active this year. Landscapes USA, for instance, acquired Peach Tree Landscapes, based in Nashville, Tenn., in June for an undisclosed sum. The company has completed an acquisition every year in the last four years, accruing seven locations. Other companies’ growth schemes, however, are making headlines. Leonard Green & Partners is preparing for a $1.5 billion sale of The Brickman Group, Reuters reported in mid-August. The Los Angeles-based private equity firm acquired a majority stake in Gaithersburg, Md.-based Brickman in 2007. Edmonds points to private equity firms and large facility service companies with smaller landscape divisions as prospective buyers. Those types of companies, he says, have been most active in strategizing this year. Other major Green Industry players ValleyCrest Landscape Cos., based in Calabasas, Calif., and Memphis, Tenn.-based TruGreen have been directing their attention toward internal restructuring instead of expansion, consultants say. Meanwhile, Scotts LawnService, based in Marysville, Ohio, has indicated it’s looking for acquisition targets and has been buying back well performing franchise locations, Landscape Management reported in September. Brian Corbett, managing partner at CCG Advisors, says there are a number of private equity groups with investments in the Green Industry possibly interested in making M&A transactions. • McKinney Capital, with investments in Landscape Workshop, based in Bessemer, Ala. He also listed facility services companies with smaller landscape divisions he anticipates will make moves, including Norwalk, Conn.-based EMCOR Group, which owns U.S. Maintenance, and ABM Industries, which owns OneSource Services, based in Tampa, Fla.
“One would assume they would either begin looking to grow, including via acquisition, or it would seem to make sense they might look to spin off what are obviously not core operations,” Corbett says. In August, facility services firm ISS Group chose to spin off when it sold the California portion of its landscaping division, Grounds Control, to Four Seasons Landscape and Properties Services, based in Santa Clarita, Calif.
On the sellers-end of the market, Edmonds says, for small- to medium-sized companies looking to sell, the market is more in their favor than past years. Another foreseeable trend is an increase in employee stock ownership plans (ESOP) as opposed to M&A transactions, Corbett says. He attributes the projection to a raise in the capital gains tax. ESOPs create a retirement plan for employees that acquire stock from the owners, allowing owners to sell interest to employees. Some plans also allow employers to take money out on a tax-advantaged basis through investment banking-led financial transactions. “This is called a leveraged ESOP and has been utilized by many companies in the market, especially those who are not an ideal fit for the strategic buyers,” Corbett says. Companies such as Sunflower Landscaping & Maintenance, Delray Beach, Fla.; The Groundskeeper, Tucson, Ariz.; AAA Landscape, Phoenix; and The Greenery, Hilton Head Island, S.C.; are engaged in ESOPs, he says. On the downslope as a substitute for M&As are partnerships, Harkness says. While alliances, such as the one formed between The Bruce Co. of Wis., and Reliable Property Services, based in St. Paul, Minn., may have shown promise at the beginning of the year, Harkness says the 3PG Group discourages them. “We’ve undone more partnerships than encouraged partnerships,” he says. The Bruce Co. and Reliable’s partnership allows the companies to remain separate entities but share operations. For example, Reliable took over golf course maintenance operations, yet The Bruce Co. continues to oversee its own golf course construction operations. “You really have to have some good personal and financial synergy to make it work,” Edmonds says, echoing Harkness’ insights on partnerships. Something the industry won’t see changing, Edmonds concludes, is the unbalanced amount of buyers versus sellers. 1 Comment on "M&A outlook: Eyeing their moves"